State media later called more attention to Xi’s reply to Fico. On March 24, Xinhua published an article with the headline “Xi Jinping: Wo Jiang Wu Wo, Bu Fu Ren Min” that spotlighted the exchange between Fico and Xi. Also on March 27, the Chinese edition of China Daily published on its website an article on translating Xi’s reply “wo jiang wu wo, bu fu ren min” into English. The article went into the history of the term “wu wo” (無我) before offering several possible translations for the reply. Xi traveled to Europe amid brewing crisis on the domestic and foreign fronts. Poor official data for the first two months of 2019 confirms our assessment that China’s economy is worsening and is on a downward spiral. Also, recent signs suggest that the CCP factional struggle is continuing to escalate. Meanwhile, China and the United States are still trying to seal a trade deal and appear to have reached an impasse on the issue of enforcement. Beijing is also coping with an international environment that is growing more skeptical of China. 1. We previously looked at how the CCP uses “secret language” to telegraph political messaging. 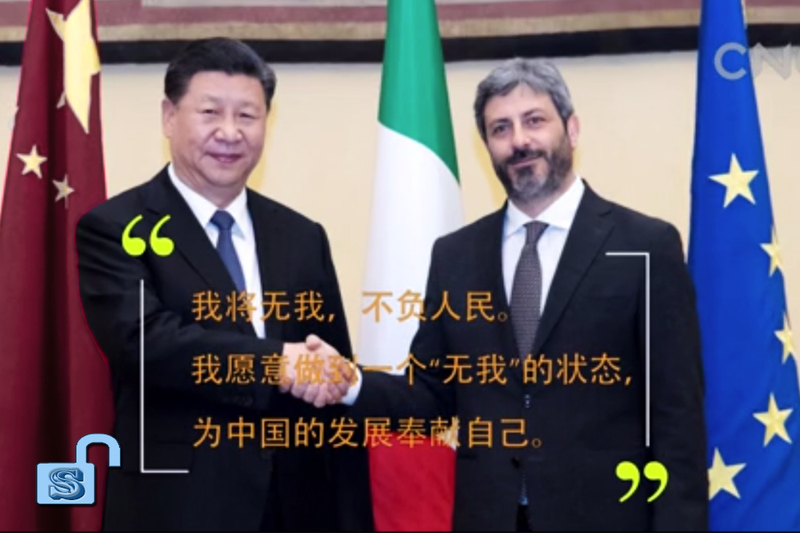 The state media’s deliberate and sustained focus on Xi Jinping’s reply to Italy’s Roberto Fico suggests that Xi is trying to signal something important. 2. Xi’s “wo jiang wu wo, bu fu ren min” is tricky to translate into English because it can be interpreted multiple ways in Chinese. Particularly problematic are the characters “wu wo,” or “non-self,” a term that is used in Buddhism or Daoism but does not exist in the communist lexicon. When CCP leaders try to sell the notion that they and the Party are acting selflessly for the people, they use more easily understandable phrases like “da gong wu si” (“大公無私”), or “wei ren min fu wu” (“為人民服務”). Clearly, Xi is trying to differentiate himself from past leaders. Xi’s esoteric word choice is also probably a reason why state media needed to write follow up articles explaining what Xi meant. Previously, senior CCP cadres like Wen Jiabao and Zhu Rongji have also espoused the idea of self-sacrifice for the people in pushing reform-minded agendas. When Zhu was promoted to vice premier in 1991, he famously quipped that he had “prepared 100 coffins, 99 for corrupt officials and one for myself.” Yet despite their high-minded talk, neither Zhu nor Wen were successful in advancing their agendas. 3. Xi Jinping is likely targeting both a domestic and foreign audience with an eye on Sino-U.S. trade talks by promoting his reply to Fico. State media has been laying the groundwork for some time for Xi to possibly make concessions to the U.S. on trade and other issues. Xi’s “wo jiang wu wo, bu fu ren min” reply falls in the same category of propaganda. By selling the idea that Xi is willing to sacrifice himself to serve the people, the CCP can more easily explain that potentially controversial concessions were made with the people’s best interests at heart. Meanwhile, “wo jiang wu wo, bu fu ren min” has a certain toughness that echoes Xi’s call to “bite down on bone” with regard to reform and take reform into “deep-water territory.” This signals Xi’s determination to his political enemies and serves to put them on notice should they resist his decision to reform. 4. Based on our research, we do not believe that Xi is pushing empty propaganda with his “wo jiang wu wo, bu fu ren min” reply. And unlike former premiers Wen Jiabao and Zhu Rongji, we believe that Xi now has sufficient political power to ram through reforms. To what extent Xi can advance reforms, however, hinges on the factional struggle. Xi faces very high levels of political risk and we are currently not optimistic about his chances of success. CCP elite politics is upstream of nearly all issues in China today. And at the core of elite politics are factional struggles within the Party. When read in the context of the CCP factional struggle, Xi Jinping’s reply to Italy’s Roberto Fico is a leading indicator of Black Swan events in China. 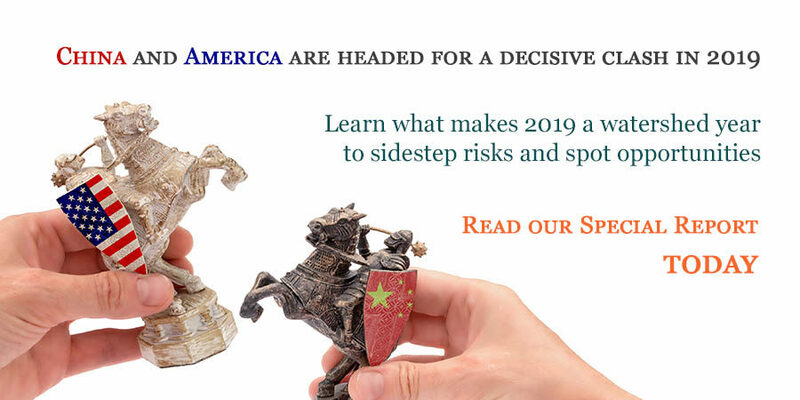 Businesses, investors, and governments who do not wish to be blindsided by Black Swans and instead are looking to seize opportunities must track such leading indicators and closely monitor factional politics. Going by the mainstream narrative on elite Chinese politics, some observers may be inclined to believe that Lighthizer is referring to Chinese vice premier Liu He in speaking about reformers at the “very senior level.” Other observers might presume that only “hardliners” remain in the Xi leadership. We do not know who Lighthizer might be referring to when mentioned high-level reformers in China. But we do know that he was at the dinner table with Trump and Xi when the two leaders met in Argentina on Dec. 1, 2018. Liu He does not have the political power or ability to carry out reform on his own initiative. In terms of CCP hierarchy, Liu is in the Politburo and ranks below members of the Politburo Standing Committee and General Secretary Xi Jinping. In terms of factional politics, Liu is not a princeling, does not have military power, and did not appear to be part of any major faction before Xi took office. In fact, Liu’s owes his current portfolio and office entirely to Xi. And if Xi did not tolerate reform, Liu would not have his current portfolio and posts. Liu He is negotiating with U.S. trade officials as Xi’s special envoy. He is also the leading official behind Xi’s economic reforms proposed at the Third Plenum of the 18th Central Committee in 2013 and Xi’s deleveraging campaign in 2016. It is hard to imagine why Xi Jinping the “hardliner” keeps turning to a reformer like Liu He and hands him responsibilities that are usually reserved for more senior officials like premier Li Keqiang.